A traditional office coffee solution. You’ve seen glass pot brewers for years and there’s a reason for it – this classic design brews a great pot of coffee. 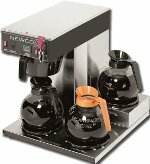 With one brewing station and three warming stations, your employees will always have a fresh pot on hand. Valley Coffee provides sanitized pots on every delivery visit. 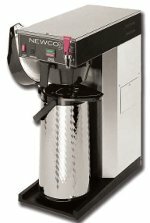 Airpot coffee brewers offer loads of convenience. This insulated design will keep a pot of coffee fresh and ready-to-serve for hours on end. Offer your employees and visitors a variety of brews to choose from by taking advantage of Valley Coffee’s huge selection of regular, decaf, and flavored coffees. Take your coffee pot with you. These high-end carafes keep the coffee hot while looking great. 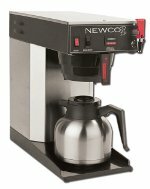 With their stainless-steel design, there’s no need for a burner and the coffee retains its original flavor and temperature. Take it with you to a conference room and enjoy perfect coffee for the duration.